Ruth Sutherland is a rare gem – she’s both a great harper AND a beautiful singer. Born and raised in Woodstock Ontario of Scottish parentage, she spent her childhood summers travelling the highland games circuit as a competitive dancer, while her parents ran their “Little Tartan Shoppe”. She holds a B.A. in Voice at Wilfrid Laurier University, and paid off her student loans by moving to Hamilton, singing jingles and doing studio work at Daniel Lanois’ Grant Avenue Studio as a vocalist and harper. Ruth has traveled to Canada, Europe, and the United States. She has twice been invited to perform as a solo artist at the Festival Interceltique de Lorient, in France. Ruth sings not only traditional music, but also her own original compositions. She has released three solo recordings: “Journeys”, “Rantin’ & Rovin'”, and “Bones & Runes”. Conductor Boris Brott of the Hamilton Philharmonic Orchestra has four times featured Ruth in the Brott Music Festival, both as a solo performer and in front of the National Academy Orchestra. The College of Piping in PEI has featured Ruth on their Christmas CD entitled “Ancestral Voices” along with Michael Burgess. Ruth has performed in high profile concerts with the likes of Leahy, John Allan Cameron, John Renbourne, and a tribute to Stan Rogers. 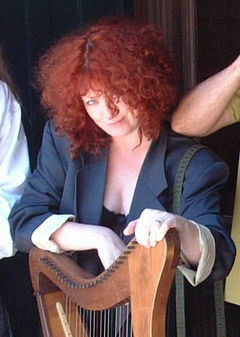 Ruth contributes her singing, songwriting, harp, and percussion talents to Scantily Plaid. She also assisted in the mixing of their first CD.